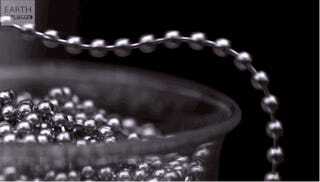 This is the bead-chain experiment. It's about to melt your brain. Inside this beaker is a 50-meter-long string of 8,000 beads. Watch what happens when you toss one end of the string out of the beaker. Prepare yourself – this is pretty wild. As you've no doubt noticed, the result is a levitating, single-file stream of beads that buckles, loops and coils in a self-propelled bid to escape its container. It's mesmerizing. In the video, the folks at Earth Unplugged meet up with BBC's Steve Mould to explore the secret to these self-siphoning beads (aka "Newton's Beads"), with the help of some super slo-mo footage. Look at it as a sort of tug-of-war. You can see the outer chain is going to be travelling really quickly as it falls, which means the inner chain is going to be travelling really quickly, as well. And if you've got something traveling really quickly, it's got momentum... So you've got the inner chain traveling up, but it wants to change so it's traveling down, but it can't do that in an instant, because that would require infinit force. So why do you get different loops and waves and coils? Watch the video to find out. Edit: A previous version of this post claimed that the beads in the video were magnetic. They aren't. Which, in its own way, makes this experiment even more ridiculous.